The "premium" versions of EMI tracks will lack the digital locks common to songs available via many online sites. The move is significant because most download sites currently try to limit piracy by restricting what people can do with music they buy. Apple's iTunes store will start selling the EMI tracks in the "premium" format in May, with other services to follow. EMI, the world's third-biggest record label, said every song in its online catalogue will be available in the "premium" format. It said the tracks without locks will cost more and be of higher quality than those it offers now. Popular EMI artists include Lily Allen, Joss Stone, Robbie Williams, Coldplay and Corinne Bailey Rae. Contrary to early speculation there was no announcement about music from the Beatles going online in any format. On iTunes EMI tracks free of digital rights management (DRM) software with twice the audio quality will cost $1.29 (99p). Itunes users will be able to upgrade previously purchased EMI songs and albums for 30 cents (20p) a track. Apple will continue to sell DRM-protected versions of music tracks, including those from EMI, for 99 cents (79p). All EMI albums will now be free of DRM and at the higher quality with no increase in price. "Consumers tell us they would be prepared to pay a higher price for a piece of music they can play on any player," said EMI boss Eric Nicoli at a press conference in London. 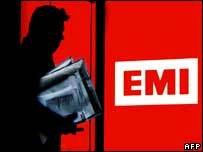 Mr Nicoli said the move did not diminish EMI's fight against piracy. DRM has been hailed by some in the industry as the most effective way to stop illicit copying. "We have to trust our consumers," he said. "We have always argued that the best way to combat illegal traffic is to make legal content available at decent value and convenient." Mr Nicoli said EMI was still in discussions with Apple Records over the use of Beatles songs online. Analyst Mark Mulligan, with Jupiter Research, said the announcement "changes not just the rules of the game, but the game itself". He said: "It's a reflection that EMI is in a more difficult situation than the rest of the record labels - they have to gamble. "It's the right move but it's a limited gamble; about 5% of the music market is online." He said he expected the other record labels and online retailers to follow suit in due course. "Other retail partners have to come to the party because they can't be seen to be offering an inferior product." The move means that consumers will be able to move music tracks between different music players at will. For example, EMI songs bought via iTunes could be played on iPods and other players too. Although this is possible today it typically involves converting downloaded tracks into neutral formats - which often means a loss of quality. He said the more than half of all the tracks available in the iTunes store would be available DRM-free by the end of the year. In January Mr Jobs issued an open letter to the music industry calling on it to abandon DRM. Although DRM is designed to thwart pirates by limiting how many copies people can make of tracks and where they can play them, critics argue that it goes further than the law allows and punishes innocent consumers. Mr Jobs said the move to remove DRM on music was not a precursor to a similar step in the video market. "The music and video markets are not parallel. The video industry does not deliver 90% of its content DRM-free." He denied that the 99p cost for tracks without DRM constituted a price increase. "We are adding another product, priced higher, with more features, higher sound quality and hassle free interoperability. "It's not a price increase." Should there be fewer copy restrictions on music downloads?